An earlier version of this post appeared on the Mississippi Atheists blog in 2009. It has been revised and updated. 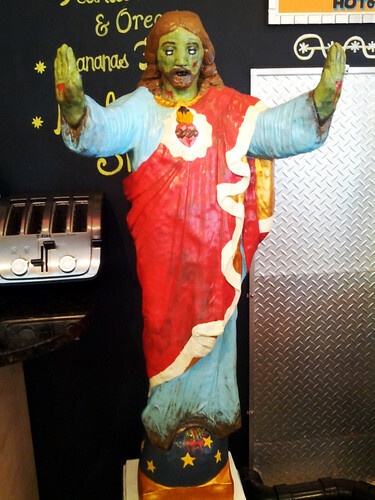 Technically, I suppose that Easter is Zombie Jesus Day. Still, Halloween always seems like a good excuse to remember that many Christians believe in ghosts, think that angels and demons are battling for their "souls," and insist that they have "a personal relationship" with a 2,000 year-old zombie. It is almost as if every day is Halloween for Christians. Since moving to Mississippi, I have found the local reactions to Halloween to be quite fascinating and very different from anything I've encountered elsewhere. While there are certainly people here who enjoy the holiday as much as I do, it seems that many Southern Baptists are absolutely terrified of the day. They drag their children to a variety of church activities to make sure that they aren't possessed by evil spirits. They seek to keep their children away from the "demonic" forces they assume prowl their neighborhoods each year around this time. And of course, they love to use this time of year to remind everyone else of their hell, especially those with whom they disagree about various social and political issues. One of the things I find myself marveling at every year around this time involves the lengths to which some of these Southern Baptists will go to avoid mentioning Halloween at all. One of the countless Southern Baptist churches I pass on my daily commute has a large sign out in front advertising a "harvest festival." Next to the sign are some rather creepy looking life-sized humanoid figures which appear to be made out of straw of some sort. Because they are positioned so close to the road and are generally the right size and shape as to be human, they have startled me on more than one foggy morning or dark evening. Frankly, I think that putting them so close to the road is liable to cause an accident if someone not paying attention swerves to avoid hitting them. It seems like they want some of the creepiness, the pumpkins, the Fall colors (or at least the colors some get to enjoy this time of year), and the festival atmosphere without acknowledging Halloween because their children might actually enjoy it and...you know...demons. Obviously, I'm perfectly content to enjoy Halloween without them. I just get a kick out of how frightened some seem by the prospect of anyone enjoying Halloween. You are literally surrounded by people who believe that they are drinking human blood and eating human flesh at their churches, people who regard you as less than human merely for being an atheist, and who are all too excited about the prospect of your being subjected to everlasting punishment in their hell. Feeling that tingle up your spine yet? Yeah, me too.